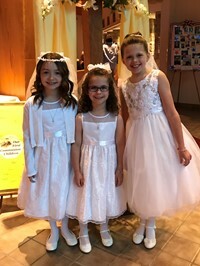 The Religious Education Office at St. Brendan Parish is responsible for preparation for the Sacraments of Baptism, First Reconciliation, First Eucharist and Confirmation. Information about preparation for each of these Sacraments is listed below. If you have any questions or would like more information, please contact the Religious Education Office at any time. We look forward to working with the families in the parish and the celebration of the Sacraments each year! Baptism Preparation – Baptism in the Catholic Church can be celebrated at any age! Birth-6 years old: The Religious Education Office offers classes throughout the year for parents who wish to have their baby/young child Baptized. Classes are publicized in the parish bulletin periodically. 7-18 years old: The Religious Education Office works with families who wish for a child ages 7-18 to be Baptized. After an initial meeting with Mary Oldja, a plan is created for the family. Preparation time varies based on the needs of each individual child and their family. Adults: The Rite of Christian Initiation of Adults (RCIA) prepares adults who wish to be Baptized. RCIA meets weekly throughout the year. For more information contact Barb Lester at (440)777-7222 ext. 15. First Reconciliation and First Eucharist Preparation – At St. Brendan Parish we are very proud of one of our longest standing traditions, the Holy Family Program! This is the Sacrament preparation program for First Reconciliation and Eucharist. The Holy Family Program involves the entire family in the preparation process: parent meetings are held at the parish, resources are provided for parents to use at home with the children, and retreats are held for each Sacrament for all children and their parents. The Sacraments are celebrated as a family at the Holy Family Penance Service and the First Communion Masses. Information is mailed to all 2nd grade families each year in August. Preparation for First Reconciliation and First Eucharist for children older than 2nd grade is determined by the age and needs of the child. Contact Mary Oldja for more information. Confirmation Preparation – At St. Brendan Parish, Confirmation is celebrated with students in 9th grade. Preparation sessions are held throughout freshman year after the fall Confirmation Parent Meeting. The Religious Education Office and St. Brendan Parish Youth Ministry work together on Confirmation Preparation.